Heat oven to 375°F. Unroll both cans of dough. Place in ungreased 15x10x1-inch pan, long sides overlapping to fit pan. Press in bottom and up sides to form crust. Bake 10 to 15 minutes or until golden brown. Cool completely, about 30 minutes. In small bowl, beat cream cheese and pizza sauce with electric mixer on medium speed until smooth. Spread over cooled crust. Top with remaining ingredients. Serve immediately, or cover and refrigerate up to 2 hours. Cut into 8 rows by 4 rows. Make it your way! 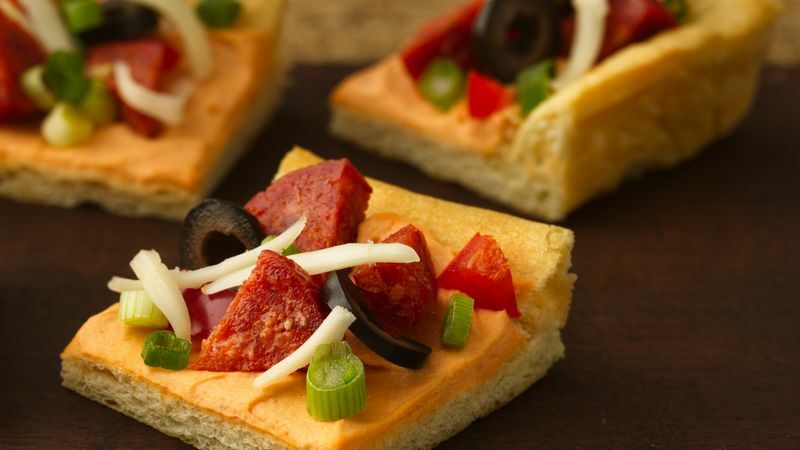 Add pizza toppings to the appetizer just as you would when you create the hot version!